Ahhh Microsoft Excel spreadsheets, an important and usually unavoidable tool in the day-to-day operations of an office worker. 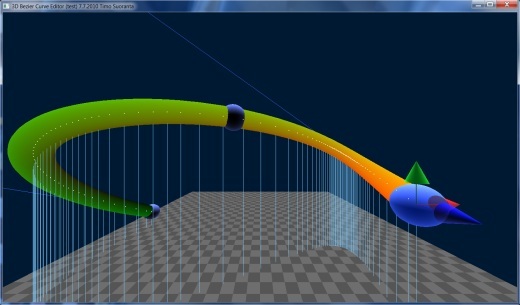 I too was inextricably bound to Excel during my professional programming career. Ahhh, that’s because I work with said ‘normal’ office workers. One of my users then, a product manager, needed access to the database records. Due to circumstantial requirements, there’s no user interface that’s flexible enough to fix the problem. So the solution was to dump the records into an Excel file and send it to him. I would also send him a short analysis, and he would reply with the changes in the Excel file. I was to check the data integrity and then when it’s done, I would upload it into the database. As a result, I became well acquainted with basic Excel data manipulation. Moving along, I worked with more users. Customer service officers, sales representatives, marketing staff, administrative staff, switch operators (I was in the telecommunications industry), technical staff, managers and directors. One common requirement from all of them was reports. There were 3 types: in text, PDF and Excel. By far the most popular type of report was the Excel reports. That’s because it’s easily editable and be manipulated by the users. The second reason was that the data required tended to be tabular, and Excel excelled (no pun intended) in that. So to cut the story short (but the full story is in my programming guide. 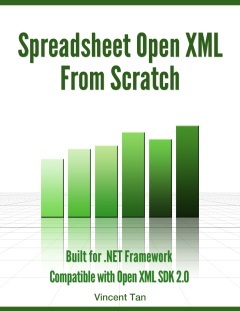 Yes, I’m going to tell you about it in a little while), I started looking into Open XML formats for Excel spreadsheets. My experiments yielded accepted results for my users. And I wrote about my experiments here. And some programmers found the articles useful. Then one fine day, it hit me; I should create a programming guide on it. Before I tell you more, answer this question. “Do you need to create Excel spreadsheets with C# or VB.NET?” If so, you’re in luck because I created a guide just for you. It’s called Spreadsheet Open XML From Scratch. This guide will teach you how to create Excel spreadsheets using C# or VB.NET and the Open XML SDK (version 2.0). You can read the full details here. The price is set at US$ 47. I decided on that price after thinking how much you will learn from it, and how much time and effort I’ve put into it. Half of the guide contains a compilation of the existing articles I’ve written, with the written material edited (some with new material added) and the source code cleaned up. The source code then was written with the Open XML SDK 2.0 CTP version. With the cleaned up source code, it’s written with the Open XML SDK 2.0 release version. There’s at least one class that will stop working if you use my old code. I’ve also written VB.NET versions of the C# code, so you can use that if you’re more comfortable with VB.NET. 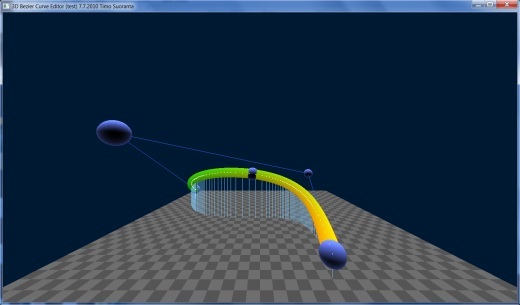 The other half of the guide contains all new material and source code. As a bonus, there’s even a section teaching you how to use an Excel template to shortcut your spreadsheet generation process. As an additional bonus, if you are one of the first 10 buyers, I will throw in a free 30 day consultation. You can ask me anything on the concepts involved, the source code, the Open XML SDK or Excel in general. This is in addition to the 1 year satisfaction and effectiveness guarantee, and 1 year unlimited free updates to the guide. This information is given to you because you’re reading my blog (it’s not on the product page). I’d offer it to more people, but there’s a physical limitation on my time. You don’t have to buy my guide if you don’t want to for any reason. No problem, you can still read my blog for free. 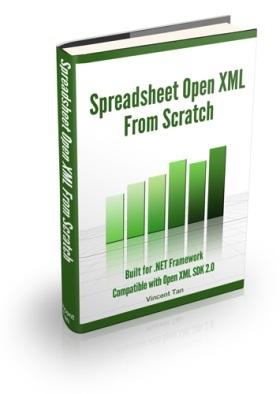 But if you’re interested, go check out my programming guide Spreadsheet Open XML From Scratch. Or you can buy the guide directly here. Thanks for reading. 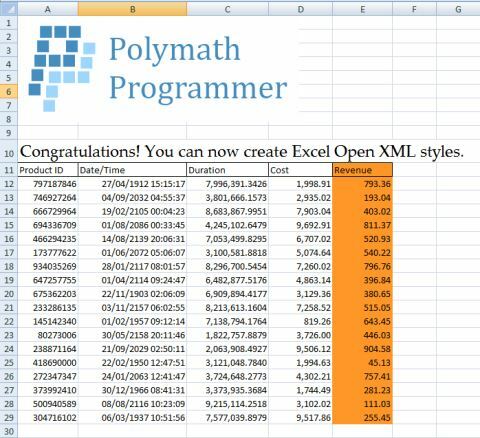 I’ve shown you how to create a stylesheet in Excel Open XML. I’ve even shown you how to insert an image in Excel Open XML too. Today, I’ll show you how to do advanced styling. Warning: confusing indices ahead. I am not going to even attempt to explain to you the various parts in detail. That might drive me insane. I’ll just broadly explain why some of the code parts exist. In the CreateStylesheet() function, you have the CellFormat classes. These represent unique styling information. And for every unique style, you need to create a new CellFormat class. Let’s look at the new unique styles we have. For background (and foreground in this case) colour, I added a new fill/patternFill with ARGB colour 00ff9728. This is in addition to the default no-patterns and gray-pattern. That orange colour is thus index 2 (0-based). For borders, other than the default no-border version, I added the borders-on-all-sides version. This is border index 1 (0-based). These are represented with NumberFormat classes, and I’ve clumped them together. Then comes the CellFormat classes. You … I … You know what, just read the code and see if you understand. I’ve already commented the index numbers above each unique style. These index numbers refer to the style index, not the border index or pattern index. These index numbers are the indices used when you want a particular cell to be formatted in a certain way. For example, the cell containing the header text should have the style index 5, where the FontId is 1 (because we used the second [Spreadsheet] Font, not to confused with the System.Drawing.Font). If you have a lot of unique styles to set, you have your work cut out for you. Download the source code. 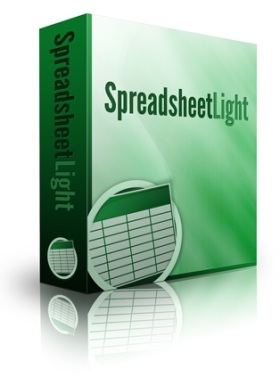 Download the resulting Excel file. Similar to when I was writing code for the stylesheet creation, I have little idea on why any piece of code has to exist for an image to be inserted successfully. All I can advise you is to insert one image into an Excel file, save it as an Excel Open XML format, rename it to a .zip extension, unzip it, and study the contents like crazy. That’s what I did. The use of the ImagePart I can understand. It’s to load the image file you had in mind. The rest is pure gibberish until you hit the part on resolution. That’s where I used the Stack Overflow articles as reference. Then it was gibberish until the positioning of the image. This is for positioning the image. I’m using the AbsoluteAnchor instead of the TwoCellAnchor. After much hairtearing, I’ve decided the TwoCellAnchor class is too hard to use. Let me tell you why. I’ve been using the OneCellAnchor and find it perfect: position by row/column and size by image extent in EMU and best of all, the image will not resize when column widths are set. So you can look at the OneCellAnchor class and see if it suits you better. The from tag should be easy to understand. The col tag refers to which Excel column (zero-based) is the left side of the image in. The colOff tag is the offset. What offset you ask? The offset from the left-border of the column referenced in the col tag, in EMU. Yes, that English Metric Unit. The row and rowOff tags refer to the Excel row and offset from said Excel row (based on the top border of the image). So far, it’s 0 for all 4 properties, because we’re inserting the image at the top left corner. Now comes the fun part. In the to tag, the bottom right of the image is in the Excel cell, column 6, row 7. That’s not all. The bottom right of the image is 248195 EMUs from the left of column 6, and 152608 EMUs from the top of row 7. Note that the image is not 248195 EMUs wide nor 152608 high. Since those offsets are calculated based on its current cell, if the widths and heights of previous cells (column and row indices less than current ones) change, these offsets change. This means, if I widen the first cell, the offset will change from 248195 EMUs to say 1000 EMUs. The fun part is, if I widen the first cell enough, the bottom right of the image could end up in column 5. So the column and column offset values are in flux. To really nail this part down, I will need to know the exact widths of every column up to where the bottom right of the image is. I will probably decide on some default column width in EMU, set every column to be that width. Then I’ll convert the width of the image from pixels to EMU and calculate the offset based on that default column width. And woe befall me if I happen to place the image other than at the top left corner, since I would have to do the same thing for the top left corner of the image. That wouldn’t be feasible if your document happen to require a fixed width for some columns, due to the content of those columns. So your columns won’t all have the same width. So you’ll have to keep track of all the column widths. Just in case you’re wondering, no, I don’t know why the ID of NonVisualDrawingProperties is 1025. That’s the value I found when I did the renaming-unzipping-gawk-at-xlsx-content trick. I believe it can be some other value, but I don’t know the valid range. If you do know, chime in with a comment. Oh and here’s the image used. And you can download the resulting Excel file ExcelOpenXmlWithImage.xlsx. We’ll be using the Open XML SDK 2.0 from Microsoft. As of this writing, it’s still in Community Technical Preview state (August 2009), so I’ll just let you search online, in case the final product is released by the time you read this article. The stylesheet is represented by the DocumentFormat.OpenXml.Spreadsheet.Stylesheet class. Through my hours (and hours and hours…) of playing around with the code, I still had to use almost the same default stylesheet when I unzip a blank Excel file in Open XML format. In case you don’t know, an Excel Open XML file (or any of the Microsoft Office products in Open XML format such as Word and PowerPoint) is basically a zip file of folders and XML files (and perhaps some media resources). This is the stylesheet XML file produced by the code which you’ll see in a bit. Download ExcelOpenXmlStyles.xml (which is actually named styles.xml in the original zip file, but I renamed it to avoid clashing with my other files). You could write an XML file directly with that content (say, using the StreamWriter class). You just have to be careful of the XML structure, such as opening and closing of tags, and taking care of child tags. Or you could use the SDK. It’s logically structured. It’s just that I can’t find anything online or in the documentation about which classes I needed to use… hence the hours (and hours and hours…) of research and testing. System-defined style numbers are less than 164 (based on my experiments on custom styles). Hence the magic number. So custom style index numbers are 164 and above. The style “#,##0.0000” is typically used by me for representing Internet traffic, as in 1,234.5670 MB. The function is static because I’m using it in a console program. There are a couple of classes used that I have no idea what they are used for. For example, the DifferentialFormats class and the TableStyles class. I just know that if I don’t create them as a child of the Stylesheet class, the Excel file will fail to open. This is the major time-drain of my research and experiments: determining the classes used to write the minimum code (or XML file). Next time, I’ll show you how to insert an image into the Excel file. That one takes up a whole lot of code when compared to inserting an image file in HTML. I’ll conclude the whole Excel Open XML creation with the full code on generating a working Excel file. I’m setting all the pieces here piecemeal so I don’t have to explain everything in one shot. In C#, the name of the variable is secondary, at least at the point when it’s created. I need an integer. I don’t really care what its name is (yet). Nor does the compiler. In VB.NET, I have to come up with a name. And if my RPG days are any indication, I take a long time coming up with names. By the time I think up an appropriate name, I forgot what type it’s supposed to be. It’s like the active-passive voice in English. “He ate the apple.” and “The apple was eaten.” Which do you want to focus on? There’s a catch though. The array in C# has 5 elements. The one in VB.NET has 6. Both languages treat arrays with zero-based indices. In VB.NET, the number used in declaring the size of the array means the last index of the array.